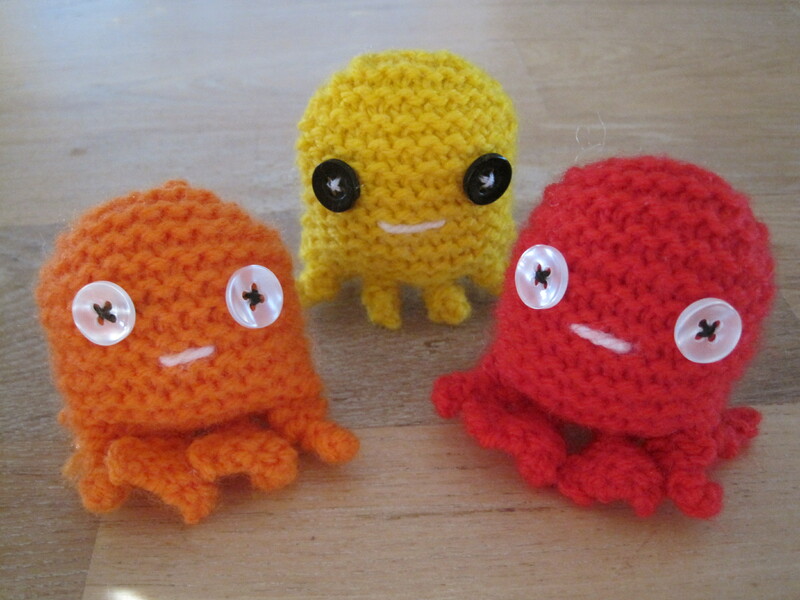 When I re-discovered knitting a couple of years ago, I started off making these super cute toys. I picked up an easy pattern book from Lincraft and got going. 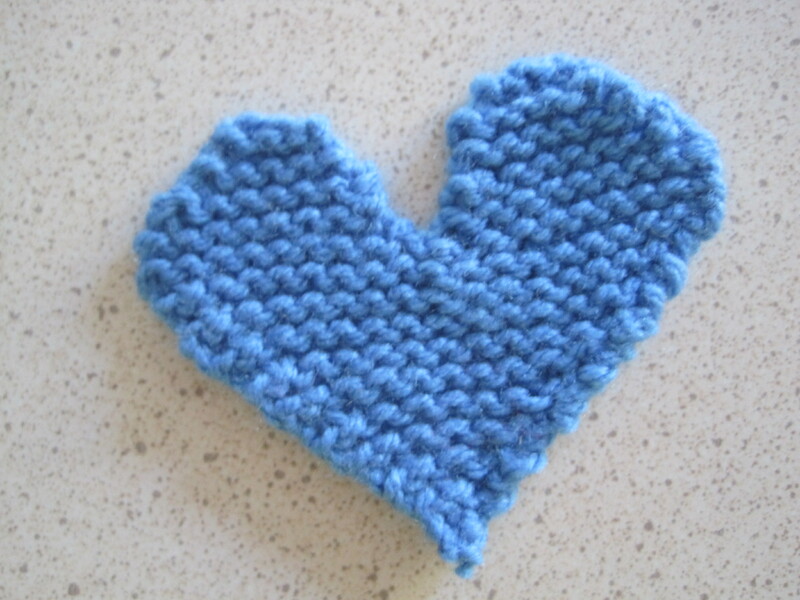 They are great beginner patterns for a quick knit without too many complications. I even taught my daughter to knit using these patterns. I did the decreases and she did the rest. It was a great starter for her as they are quick to complete so she could see results fast. Good for impatient kids! 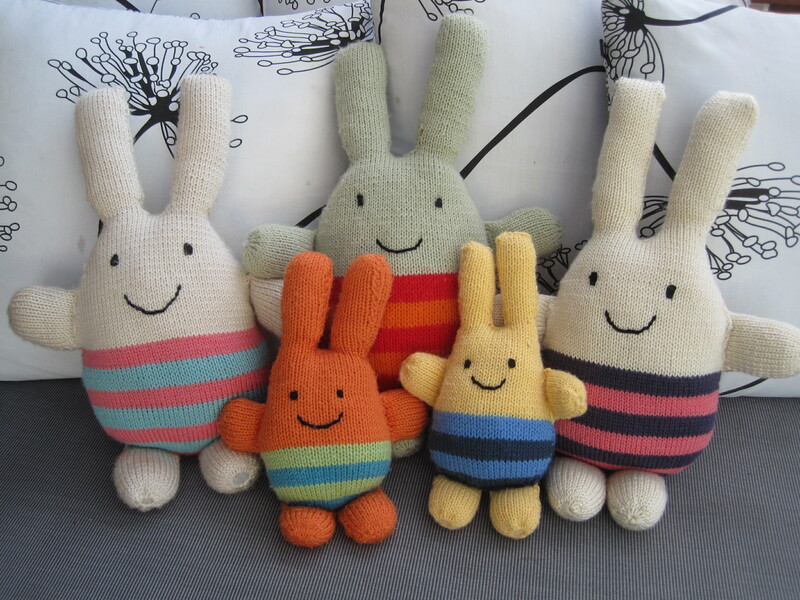 All the toys are knitted using garter stitch, and you can whip up one of the easier toys (e.g. tadpole) in an hour. There are 10 characters in all, and they are designed by Jake Henzler. The book is called ‘Little and friends’ (how cute) and is for Panda 8-ply yarn. All you need is some 8-ply yarn, 3mm knitting needles, some soft toy filling, 4-hole buttons for eyes and black thread for sewing. There are crabs, ghosts (we seem to have about 10 of these around the house), octopus, tadpole, whale, bunny and more. 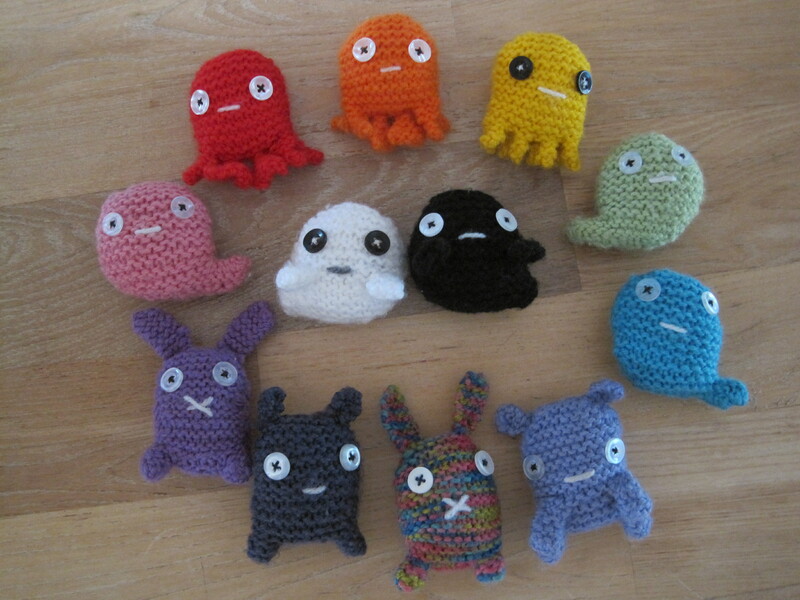 I have knitted these and added them to party bags for my kids friends, and made the bunnies as little additions to easter baskets. 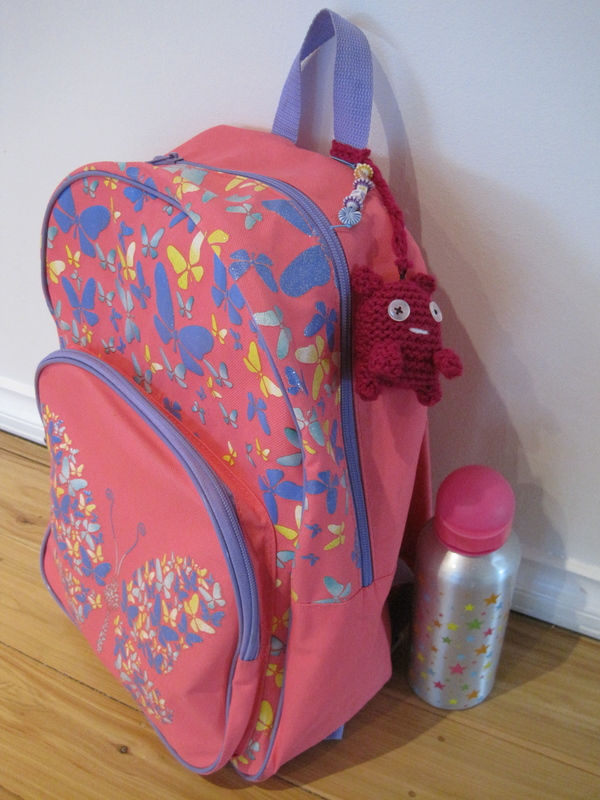 I have also made them into school bag tags – it helps when more than one child has the same bag at school or preschool. My kids love playing with these, and have been busy building lego houses for them, hanging them off ropes on the tree in the back garden, and taking them to bed. They are the most played-with toy in the house. 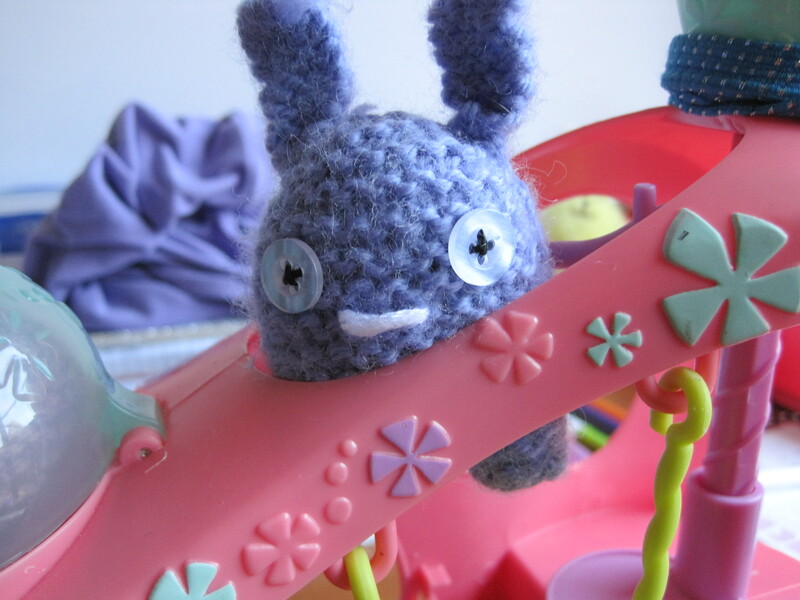 I’ve moved onto bigger things since then, (see my knitted bunnies) but I do still knit the odd one. Its probably time to start knitting some grown-up things now though. 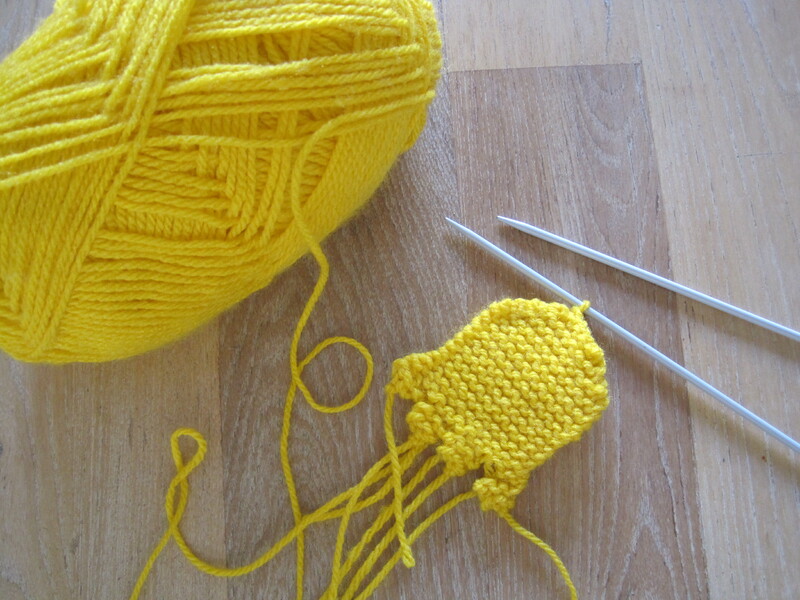 What is your favourite quick knit project? As the mercury plummets to the expected lows that June brings in this part of the world (its a freezing 19 degrees here! Ha ha!) I thought it was time to share my hot chocolate obsession with you. 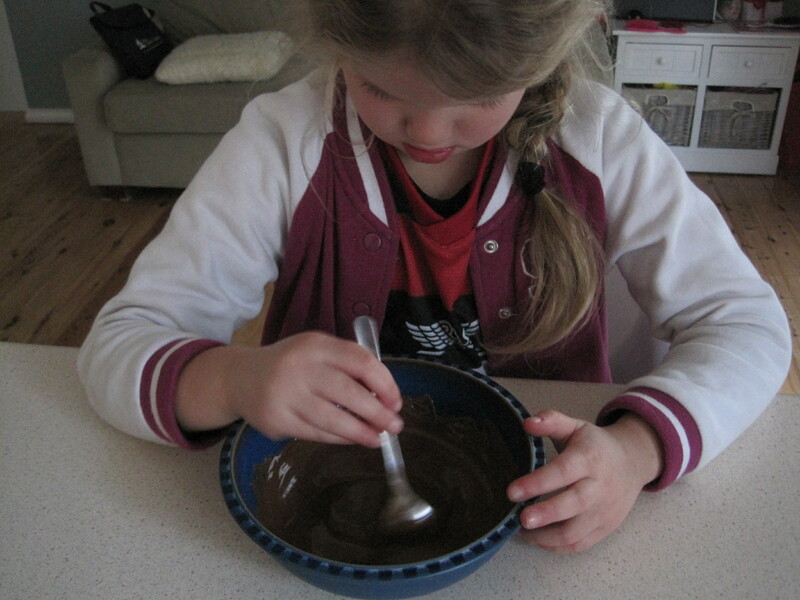 My family are all chocoholics, and enjoy the baking of chocolatey goodness. Recently, one of those chocolate cafe’s opened in our local shopping centre, which was a very dangerous thing to happen. I have to pass it to go to the supermarket! I have to exercise restraint every week. These chocolate shops, while very nice, are also quite pricey. With three kids plus me, we’re paying over 20 bucks just to get a hot chocolate each! 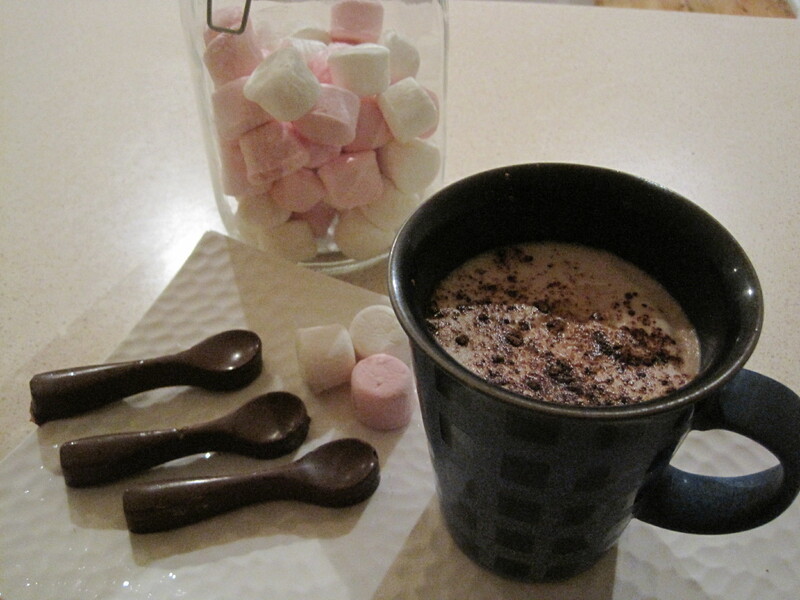 So, here are my tips for decadent cafe-style hot chocolate at home. This is soooo good and is just as great as the chocolate shop for a fraction of the cost – plus you can have as many marshmallows as you want! Heat milk in saucepan until warm but not boiling. When steamy, add chopped chocolate to milk and whisk together until melted and combined. Add vanilla and sugar, and whisk to dissolve. If you have a coffee machine you can use the milk frother to get it nice and creamy. I don’t have one, so after making the hot choc I whizz it in the blender for 20 seconds or so which gives that lovely frothy cafe-style texture. 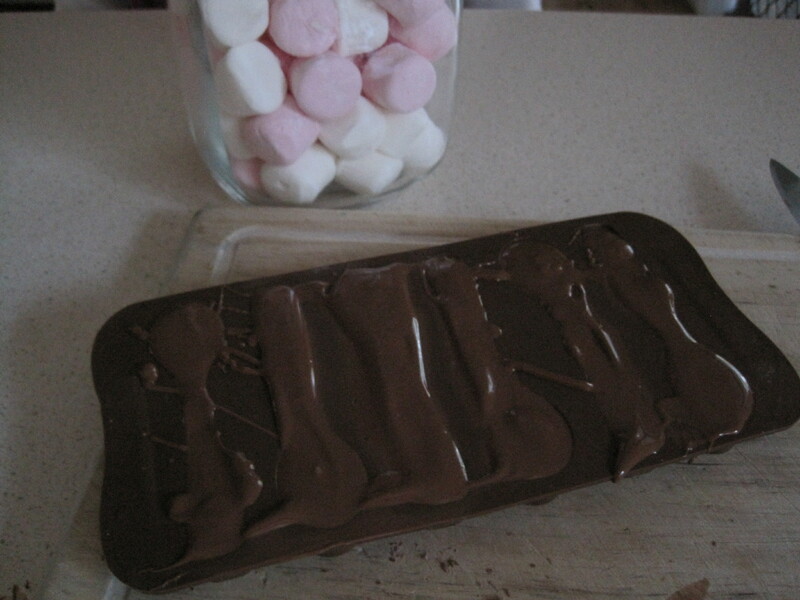 Serve with marshmallows and, for an extra special treat, chocolate spoons! I picked up this chocolate spoon mold ages ago from woolies, it might have come with a magazine, I can’t remember. Anyway, my little helper and I melted some chocolate in the microwave, spooned it into the mold and left it to set in the fridge for an hour or so. Yum! 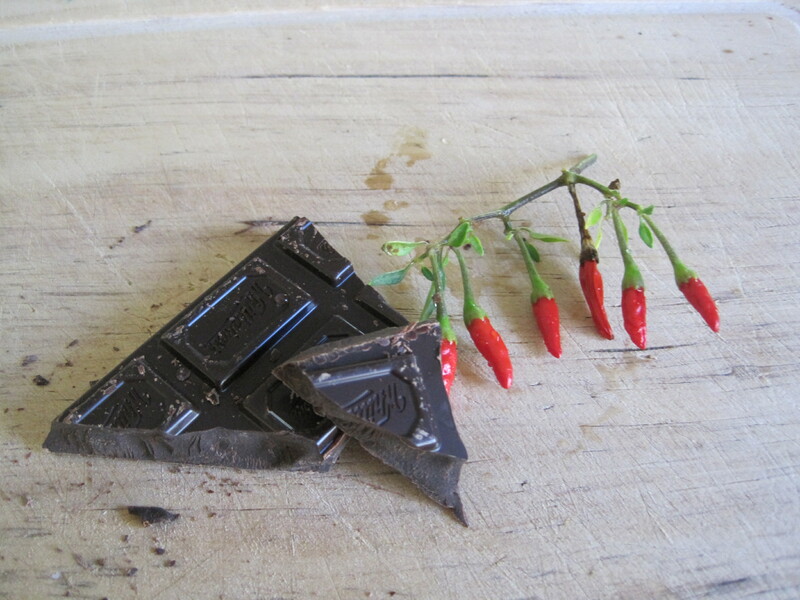 Chilli hot chocolate – while heating the milk, add a chopped chilli and a cinnamon stick. Let it sit for 10 minutes for the flavour to infuse, strain, then add the chocolate and serve. Tiny chillis from my garden – these babies are hot!!! Mint hot chocolate – You can try adding some fresh mint leaves to the milk and let infuse. I have tried this with making ice cream. While nice, I found it had that savoury mint flavour that didn’t quite work for me. My husband loved it though. Adding Peppermint essence may work better – but I haven’t tried this yet. Spiced hot chocolate – Add cinnamon and 1/2 tsp mixed spice or allspice to the milk, then add the chocolate. Baileys Hot chocolate – now this one is a winner for me. I don’t normally go for flavours in my chocolate, I like it pure and simple, but Baileys Irish Cream is awesome. Add to the finished cup of hot choc and sit back and enjoy. You could also try adding amaretto. Mmm! Coconut hot chocolate – If you are dairy free, or maybe following a paleo style diet, using coconut milk is a great substitute in hot chocolate. Heat up 1/4 cup of coconut milk and add a tsp dutch processed cocoa (or chocolate) and whisk together. Add half a cup of water and sweeten with sugar, or maple syrup. You can add more coconut milk and less water if you want it creamier. I have had this several times and it is delicious. For a quicker alternative, I use ‘Abundant Earth organic drinking chocolate’. I switched to this version from the less expensive brands due to issues with my son reacting to additives and colours in foods. I also make milkshakes for the kids from this and they are so nice. Better than any cafe milkshake with all those artificial flavours and colours. Adding vanilla ice cream gives it that decadent twist. I add 1 heaped teaspoon per cup of milk, whizz in the blender, then heat in the microwave until warmed through. This makes the most creamy frothy hot chocolate ever. 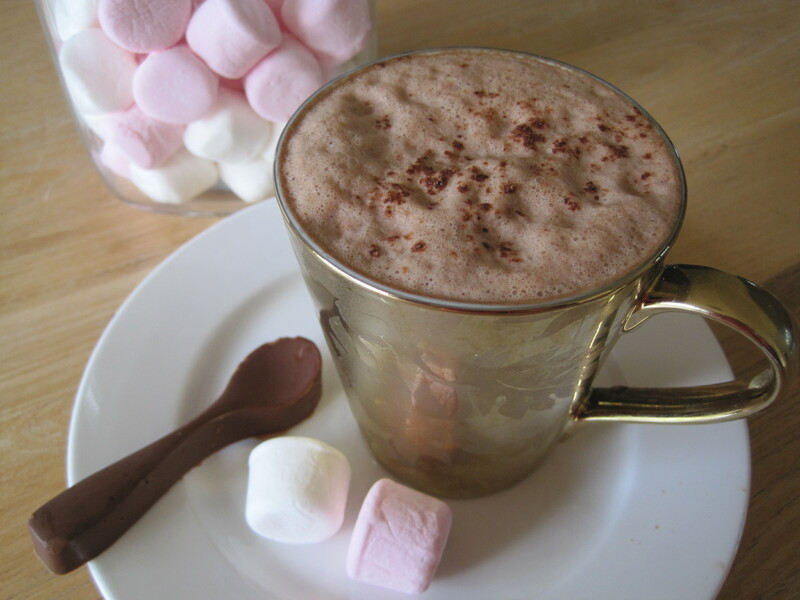 Whats your favourite Hot chocolate recipe? Do you make your own instant mix? Its been one of those ‘weetbix for dinner’ kind of weeks, hence the lack of blogging. Back to back weekends of eisteddfods, soccer games, athletics carnival, headlice (they seem to love my kids) and now a sick daughter home from school. Plus husband away with work. Its all happening. Needless to say, there hasn’t been much time for knitting, baking or cultivating. In fact, I went out to the tiny veg patch that was doing so well, only to find our guinea pigs have discovered it, and anything that was growing is now just a stump in the ground! Sigh. 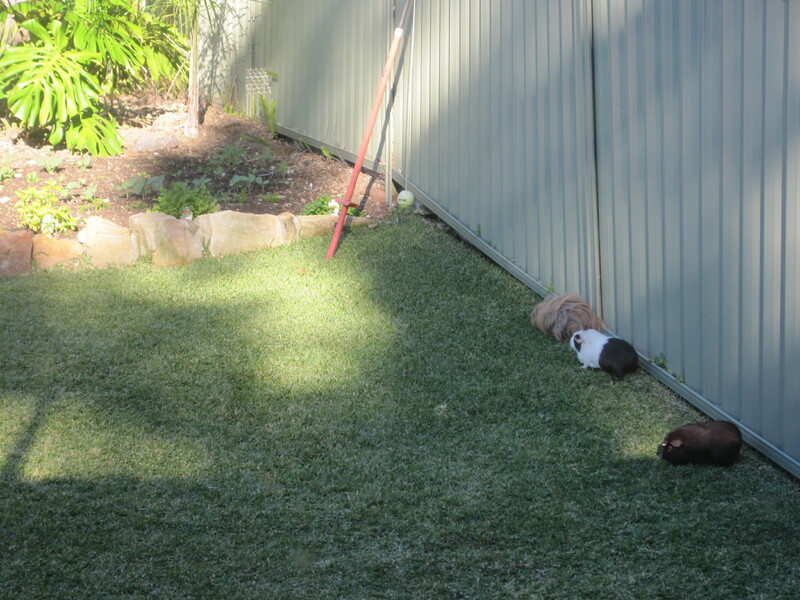 naughty Nibbles, Coco and Muff tuff heading to the veg patch – caught red handed! Still, at least I have managed a bit of knitting here and there. 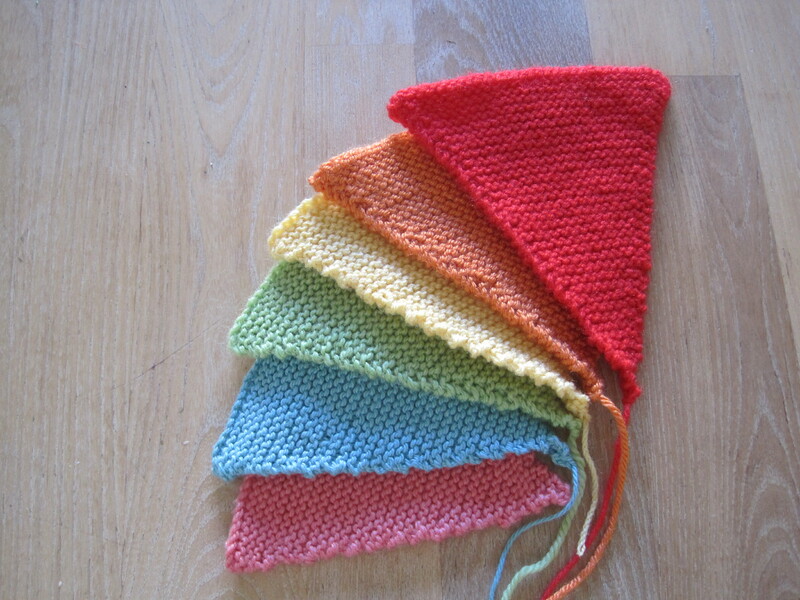 I have made progress on some knitted bunting for my daughter’s birthday. And I have continued with another project that I will reveal in my next post – just need a little more time to get it all together and photographed during daylight hours. Its dark so early now. Where does the time go? 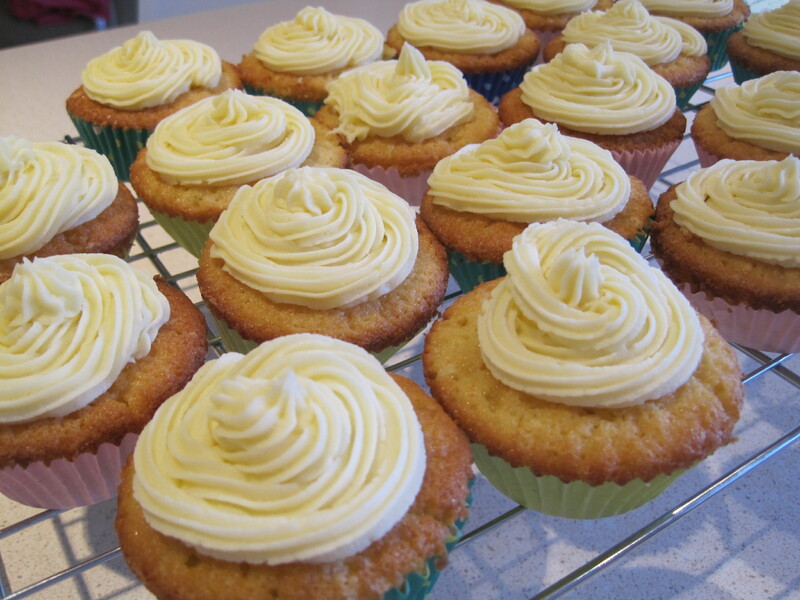 I even managed to make some vanilla cupcakes today, using the recipe from Better Homes and Gardens Magazine, May Issue. I always think of scones as a summertime treat, picturing picnics, garden parties and high teas, but I reckon a good old plate of rustic scones with jam and cream ready to pile on top is a crowd pleaser anytime. I think they make a nice afternoon tea treat after school too. No additives, low sugar, filling, and quick to make from basic pantry/fridge ingredients. My kids go mad for them. 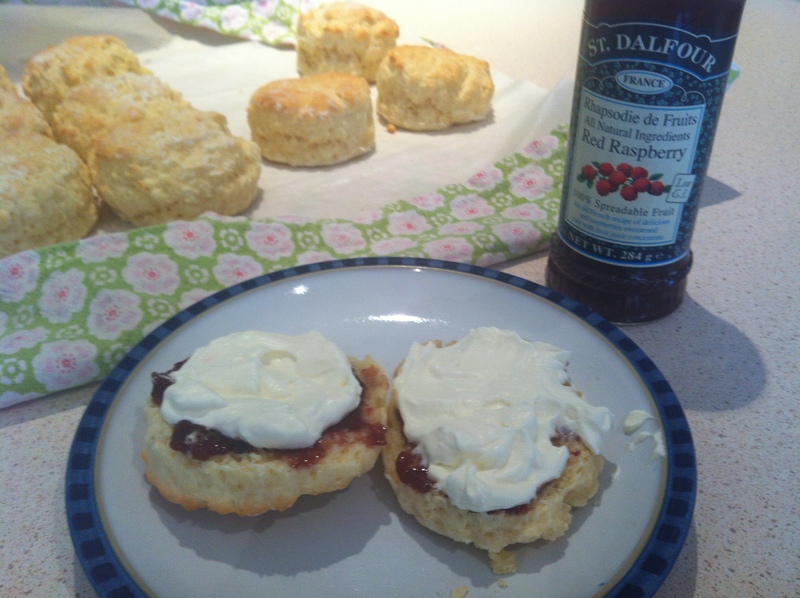 The trick to making good fluffy scones is minimal handling of the dough, so don’t overwork it. Just bring the dough together, roll it nice and thick, dust your dough cutter with flour, cut and place on a tray double lined with baking paper, and bake in a fairly hot oven for a short time. Easy. Here’s the recipe I use, handed down from my mum. I’ve been making these since I was little and I had to pull up a chair to reach the bench top. Beat cream into remaining egg. Add egg mix to flour mixture and fold to make a dough. Do not over mix. Cut with floured cutter, brush with reserved egg mixture, place on double lined baking tray, then place into oven. Bake for 12-15 minutes, until becoming golden on top. 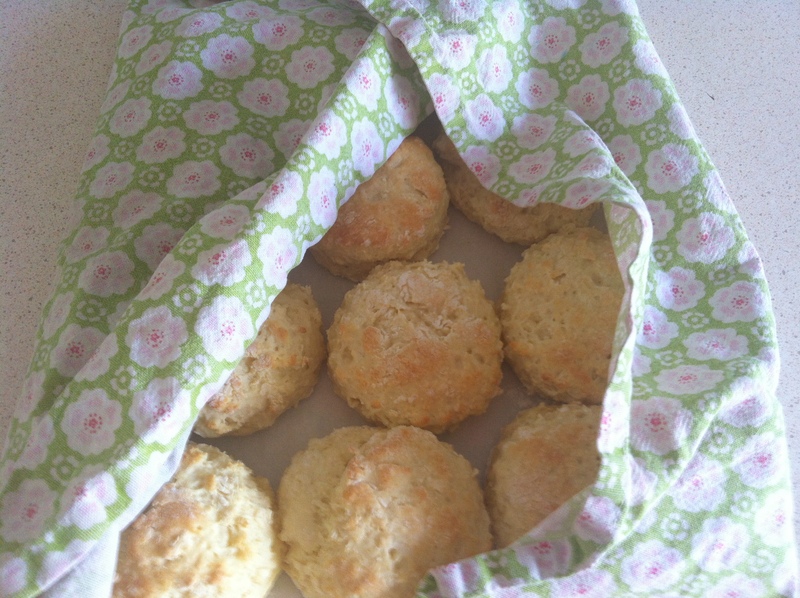 Lift scones off tray with the baking paper and wrap in a tea towel. The steam is supposed to be good for keeping moisture in. Once cooled, serve with your favourite jam and a dollop of whipped cream. You can add dried fruit or dates to this recipe for variation. Hello! I have just changed my blog theme, its a bit plain, and I liked the other one better, but the ‘leave a reply’ link was at the top of the post. This one is at the bottom, better I think, but not as pretty. oh well. 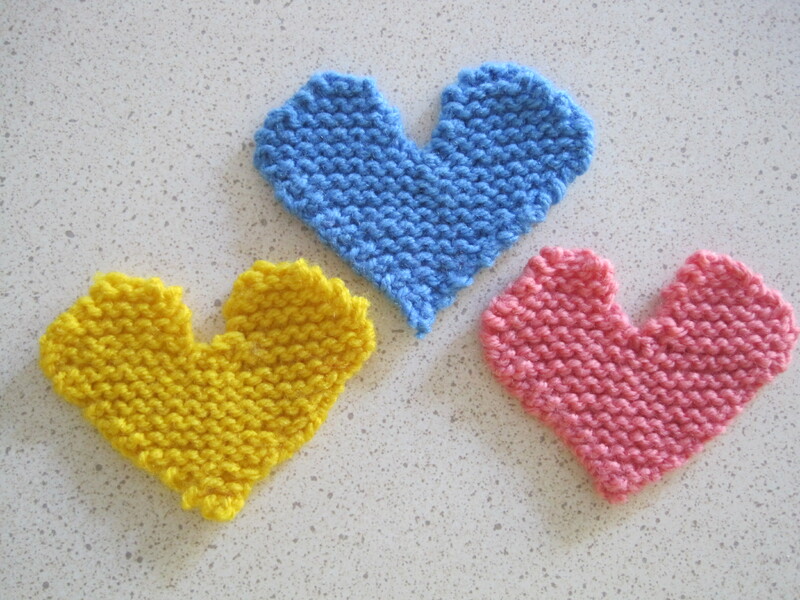 Anyway, we’re not here to chat about blog themes, its knitted heart time! 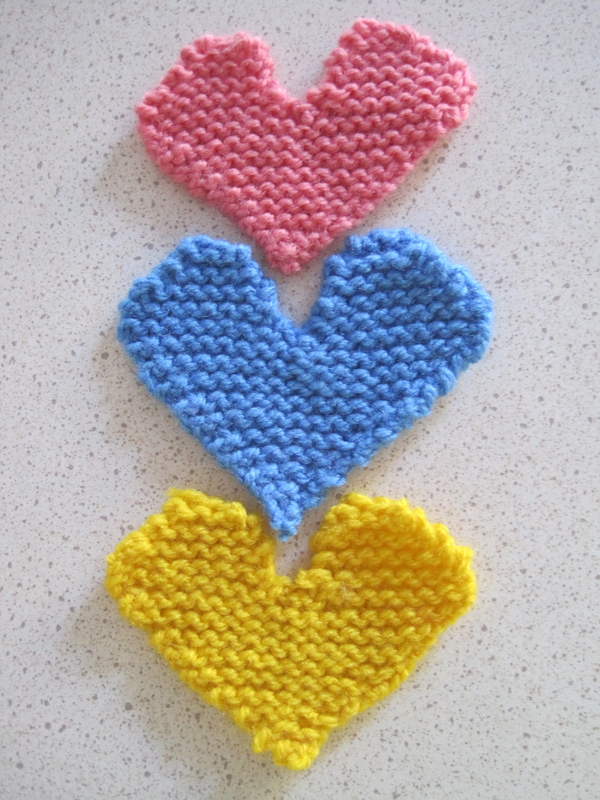 I was inspired to make this post after seeing little woollies’ lovely fair isle hearts blog post. I commented on her blog as I too had been busy with the needles to pass time on the train to the city, and I was also knitting hearts. These are different as they are done in garter stitch and I thought I’d share my made up pattern with you as they are a great way to use up leftover scraps of yarn from other projects. Here are a some photos of some finished ones. And here is the pattern. I used 8 ply yarn and 3mm knitting needles. Makes a heart sized approx. 7cm high and 8 cm wide. Fits in the palm of your hand. Use garter stitch for this pattern. abbreviation k2tog = knit 2 stitches together to decrease. 1. Cast on 2 stitches. 5. Next row, Inc in first and last stitch, 5 st. Repeat steps 4 and 5 to 19 stitches. 7. Knit and cast off 10th stitch in middle of work, then knit to end. 9 stitches each side, 18 st total. 8. You will finish each side of the heart separately from here. Keep the remaining stitches on the needle while working the first side. Knit 9, turn work around and knit 7, k2tog towards middle of work. 8 stitches. 10. Knit 6, k2tog outside edge, 7 stitches. 15. Cast off last 4 stitches on that side. Snip off yarn ready to join to opposite side to finish work. 16. Repeat steps 8 to 15 for other side. Opposite side will work differently, and you will k2tog at beginning of rows for outside edge, rather than the end as you are knitting the opposite way. 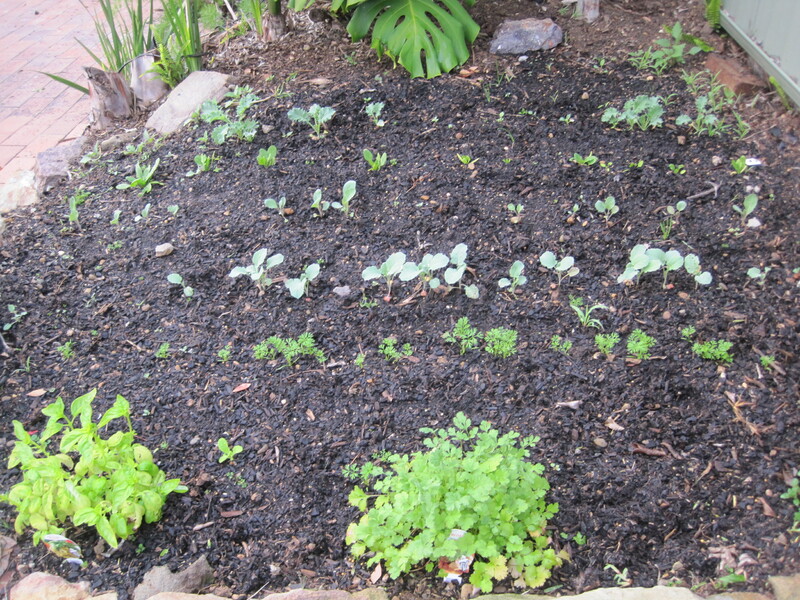 We started a tiny veggie patch in a nice sunny spot in our garden that used to be occupied by a very damaging fig tree. Not sure what type of fig, but it should never have been planted in the ground. Anyway, that got chopped down, the pool fence re-directed and the paving fixed. That left us with a bare patch of soil that we didn’t know what to do with. 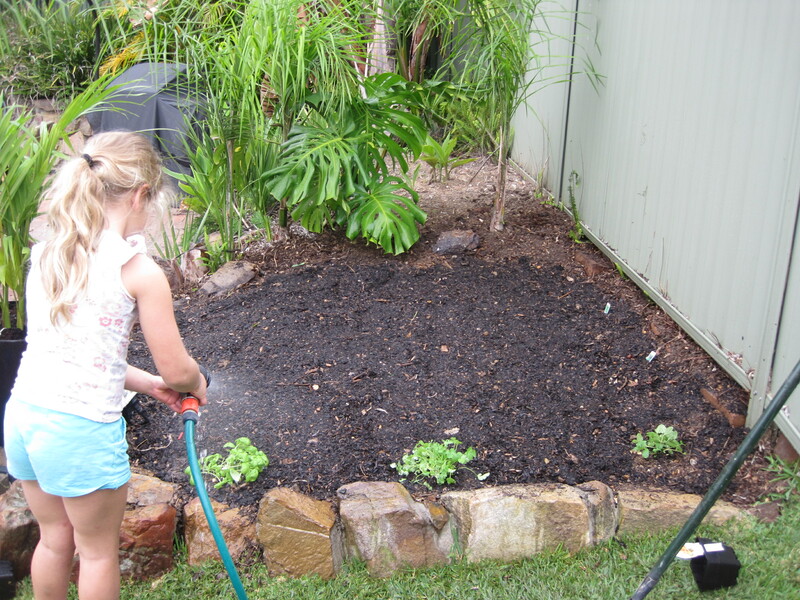 My daughter had the idea of growing some veggies, and so the veggie growing project began. We planted on the 26th April – late for autumn planting I know. We planted spinach, carrots, lettuce, broccoli, cauliflower, kale and a couple of pumpkin seeds. Another no-no apparently was to plant directly into the garden, which we did. We thought we would just throw caution to the wind and see what happened. I received warnings from colleagues at work that carrots and cauliflower were hard to grow. Well six weeks on and its not looking too bad. The kids have been so excited about the veggie patch progress, rushing out to see whats grown bigger and biggest every few days. Spinach and kale are coming along nicely, they seem to be doing well along the edge, but there is slow growth in the middle. I think maybe something has had a go at the seeds and new shoots. Maybe a bird or slugs. who knows. To my surprise the carrots look good and it looks like a near 100% seed success rate (insert more farmer-like term – germination rate?). 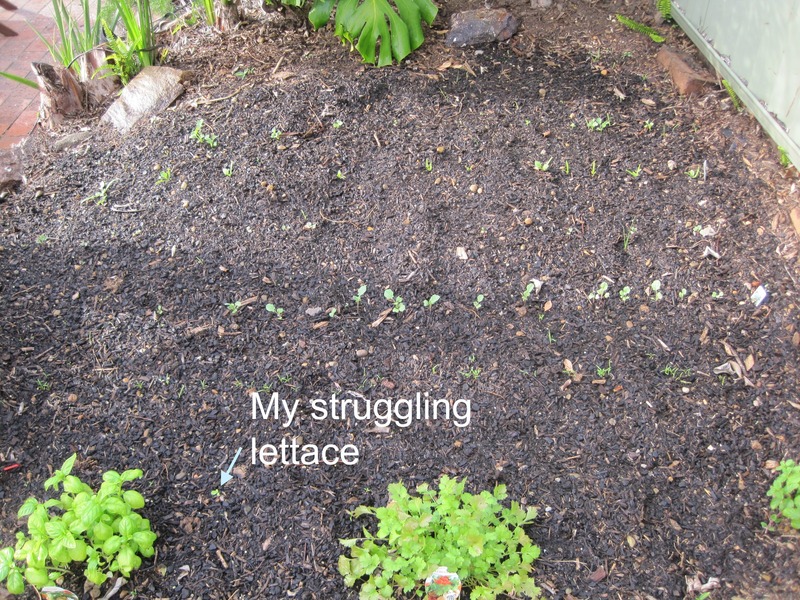 The lettuces were a complete fail, only one has finally grown, so I am nurturing it as much as possible. The broccoli and caulis are looking good. No sign of pumpkins although I was since told that its the wrong time of year and they like to grow out the compost. Next job is to feed the plants. I have been watering daily. My compost isn’t ready yet, so might have to get some fertiliser for now. How is your winter garden growing? Are you harvesting yet? When did you plant? 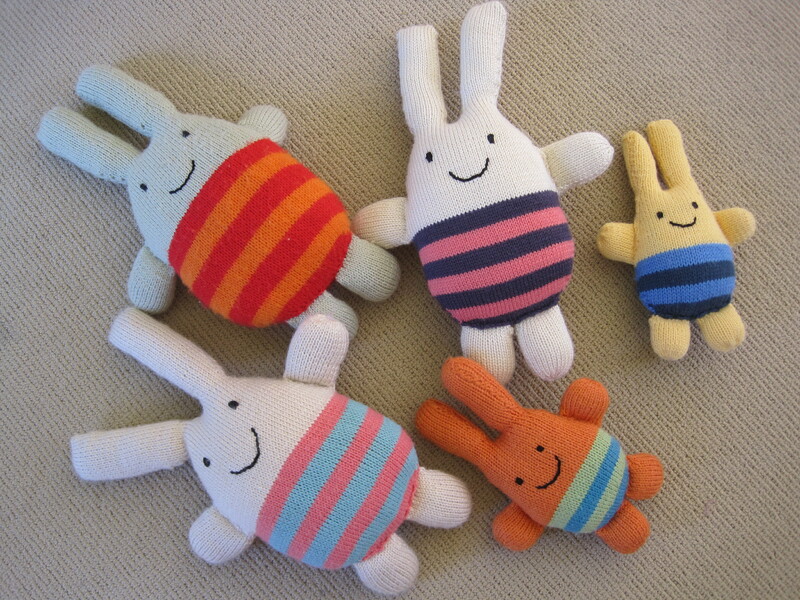 I’ve been busy lately with a cute project of knitted bunnies from a lovely knitting book I borrowed from the library. I love my local library, it has a nice stash of knitting and crochet books. 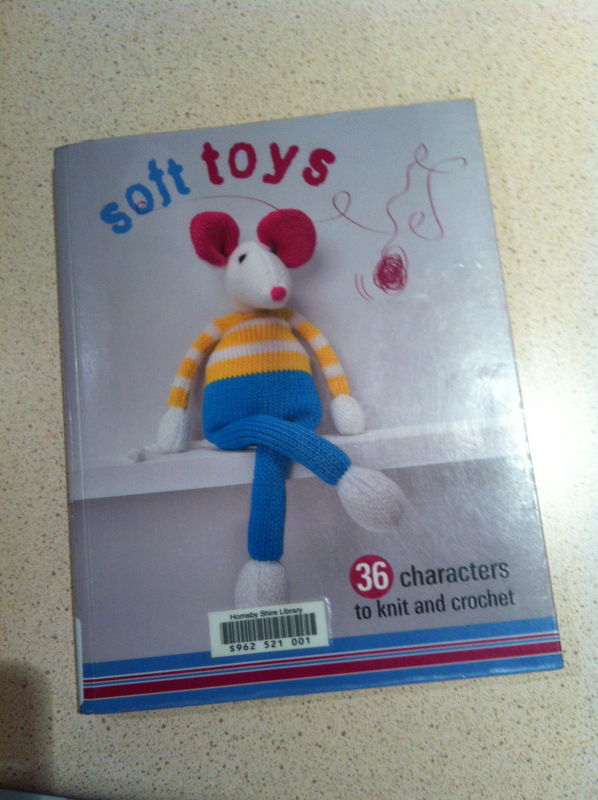 This one is ‘Soft toys: 36 characters to knit and crochet’. I haven’t quite mastered the art of crochet yet, but plan to one day. My mum and grandma taught me to knit when i was about 8 or 9 I think. I taught my daughter to knit when she was 7, and she is getting quite good now. I love the idea of passing on the old traditions from mother to daughter. 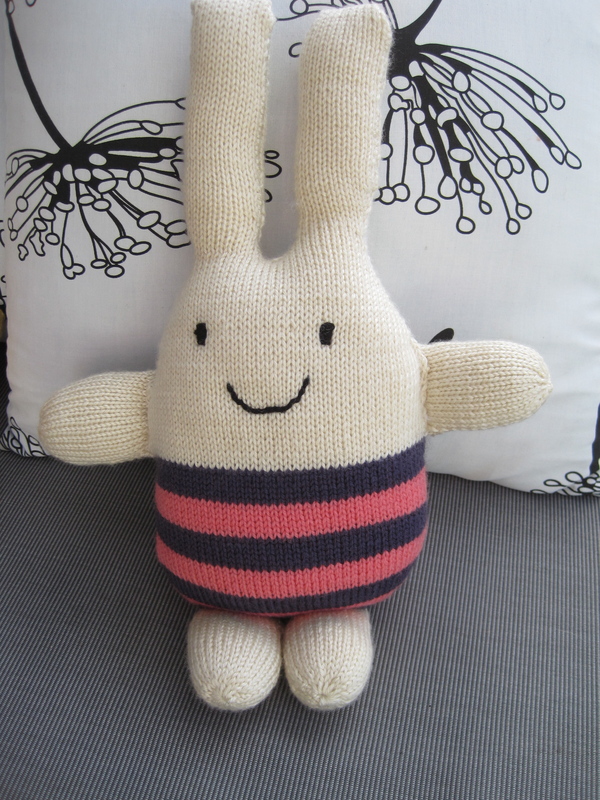 The knitted bunny patterns are for 2 sizes, and are so easy to make, ideal for a novice knitter, all done in stockinette stitch with some basic increases and decreases for shaping the body and ears. They don’t really look like proper bunnies, but you could always change the stitching on the smiley face to look more bunny-like. I quite like them as they are, but you could do a few different designs of your own. Anyone else knitting toys? What is your latest knitting project?